Often, FACT is stranger than FICTION. 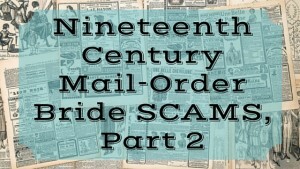 This article is Part 1 of a new sequence of blog posts regarding historical facts (mostly from various historical newspapers in the United States) surrounding various scams regarding (what is popularly called) Mail Order Brides, Matrimonial Agencies, long-distance marriage contracts, disreputable persons, and ‘friends’ looking for diversion (a bit of fun and entertainment). 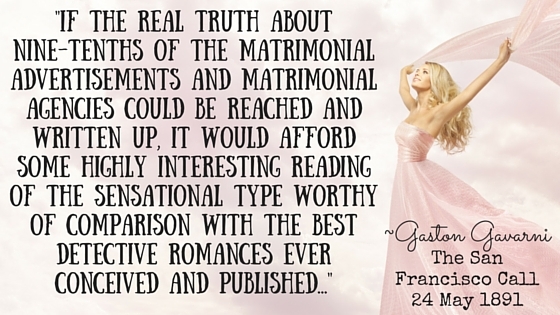 Interestingly enough, readers of Mail-Order Bride-themed Historical Romance aren’t likely to find much in the way of FACTS in the fiction we so love to read. But that doesn’t mean the true history behind the popular niche isn’t fascinating to those of us who read and write it. My last post addressed the two-sided Public Opinion regarding the idea of seeking a life partner through an agency, a personal advertisement, or some other assistance. That last post cited an article that shed a positive light on the process of a “Mail-Order Bride” (and also debunked the myth that Americans in the last quarter of the 19th Century actually called such arrangements by mail “Mail-Order Brides”–but we’ve agreed to refer to them as such). 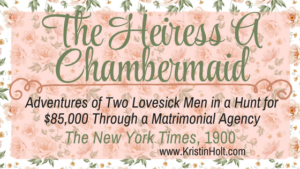 The sheer volume of newspaper accounts spread over decades in virtually every state in the Union and in the Territories containing warnings–of swindled fortunes, disappointed misses, train fare and traveling expenses sent by western grooms to their brides-to-be in New England evaporating into thin air and no bride arriving–make one thing painfully clear. Law enforcement and the average man and women simply had to know the very low public opinion of the whole idea of finding a potential mate through any sort of brokerage, company, or simple personal matrimonial advertisement. It seems the possibility of finding love (or at least a companionable, legitimate marriage) through a matrimonial service or personal advertisement was slim to none. There must have been an occasional happy story or two because women kept answering advertisements (as did men) and someone (other than newspaper reporters and swindlers) kept writing them. 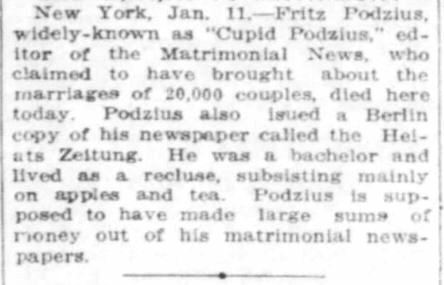 At the time of Fritz Podzius (editor and publisher of Matrimonial News)’s death in 1916, he’d claimed to have facilitated the marriages of 20,000 couples. The York Daily, York, PA. 12 Jan 1916. Death notice of Fritz Podzius, and his claim of bringing about 20,000 marriages. Oh, yes. Newspaper reporters. Whether or not they felt they were exposing crime, shedding light on a growing problem, pointing out the fallacy of youthful hearts engaging in such faulty methods of finding love… their meddling no doubt broke more than one heart and caused more than one young miss serious embarrassment. 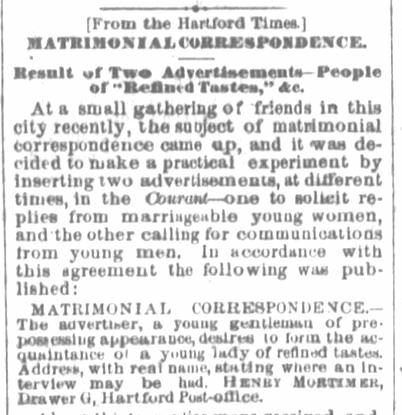 In studying historic newspapers, I found dozens and dozens of similar articles wherein an investigative reporter (male and female alike) pose as spouse-seeking society-respected adults and enter into a contract with a matrimonial agency or simply post an advertisement in the classifieds, such as the example that follows. 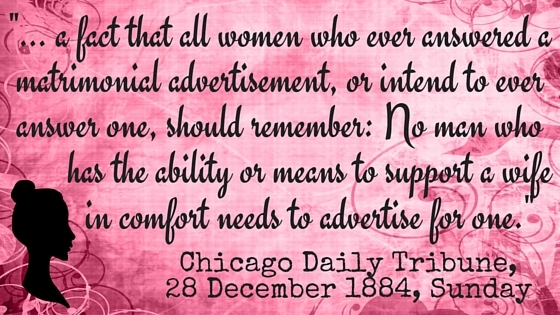 The following example is a portion of an article printed in the Chicago Daily Tribune on Sunday, 28 December, 1884. Some men sought a bride to work beside them on farms and in raising families (little more than an unpaid worker), and some men (obviously bored and seeking entertainment) posted ads as jokes and simply for their own entertainment. 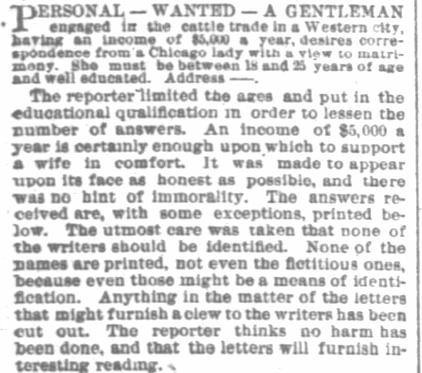 Newspapers of the era are filled with anecdotes and stories (probably with a kernel of truth) about men seeking fun by corresponding with hopeful ladies when they had zero intention of offering marriage. 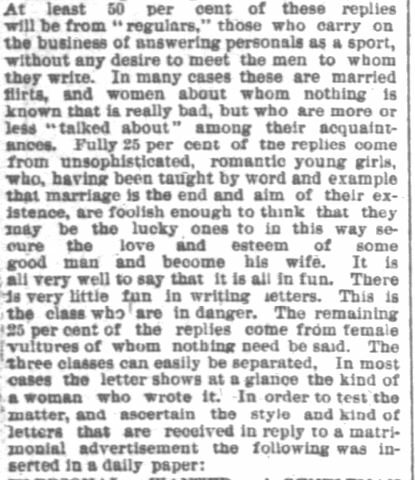 An equal accounting of flirtatious women (most of them already wed) carried on correspondences with men they had no intention of meeting. They must have found it diverting. And fun. And perhaps a little naughty. Some men’s advertisements apparently originated by someone else entirely. 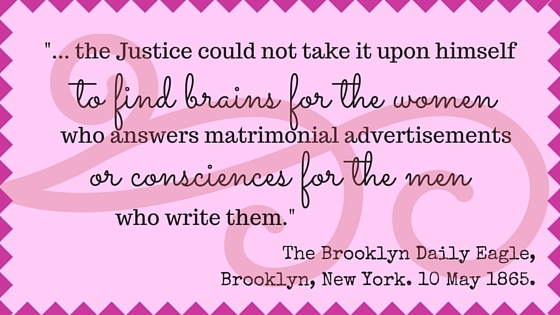 The Matrimonial News found itself embroiled in scandal by not requiring identification or references when allowing men (and women) to provide their name and submit an advertisement, as “friends” often found themselves the brunt of a joke when they received correspondence from hopeful unknown parties. Frequently such practical jokes were played by one friend upon another and apparently never made it to court or involved the law. One such example follows. If you were the brunt of a practical joke in matters of the heart, would you ever dare risk love again? I know I’d be leery. 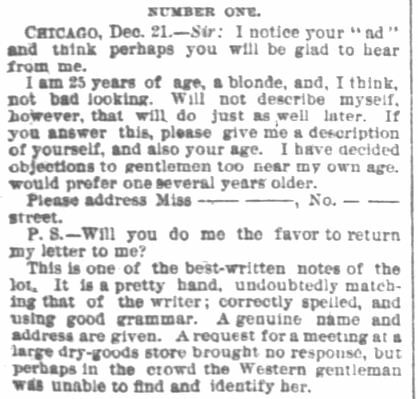 I can’t imagine (or perhaps I can) what became of the lonely hearts who risked responding to an advertisement only to learn the remarkable-sounding gentleman on the other end of the correspondence was actually a newspaper reporter. Or worse, a woman who didn’t like me and decided to do me harm. I’m interested, and I’m sure all readers are, too. What are your thoughts on this subject? Please respond in the fields provided, below. Up next! 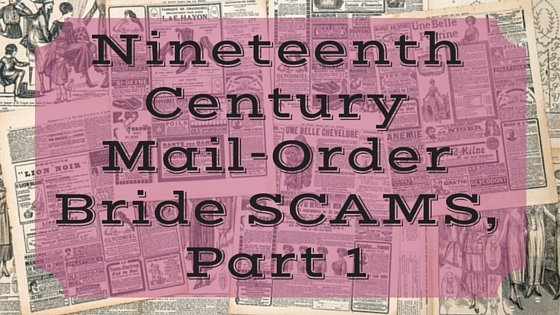 Nineteenth Century Mail-Order Bride SCAMS, Part 2, delving into money-making scams wherein the perpetrators fraudulently relieved the lonely of their hard-earned money. 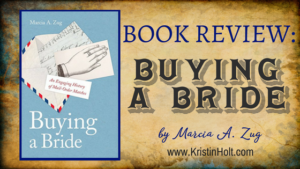 Unfortunately, there are more stories to explore and more methods of defrauding women (and men) to lighten their pocketbooks and poke holes in their dreams. 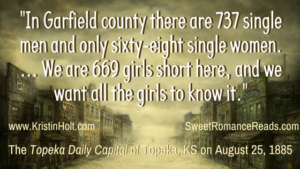 Not much different from the online dating that takes place now, is it? Oh, I agree, Karen! 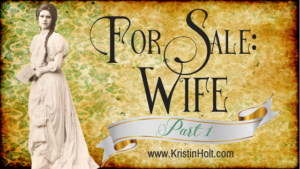 Online dating today is essentially the same thing as yesteryear’s mail order bride (or newspaper bride) attempts at finding a partner. =) Same needs. Same human desires. Different time period. Thanks for stopping by!